I’ve been working as a game writer for eight years. I have four years experience as a storyliner and scriptwriter for TV and I also have a Masters in Scriptwriting. But, that does not mean I’m going to write a fiction book that anyone is going to want to read, let alone buy. Alas, that’s what I discovered from Stormbane: A gamelit adventure. I’m undoubtedly being too harsh on myself, but the facts are the facts. And here they are. Stormbane was born from frustration. I was in Germany at the time, doing three weeks narrative dev on a dark ARPG for Goodgame Studios in Hamburg. I was still writing for Path of Exile at the time, another dark ARPG. And to be honest, it was all getting to be a bit of a grind. I was churning out a ton of story for other people, but nothing with my name on it. Nothing that I could proudly hold up and say, “This is my writing!”. Then there was the fact that I was having a few issues with gamer culture at the time, and questioning the very nature of ARPGs. So much MOB slaughter, so many “clear area” quests, so much killing of things that were just hanging out in their virtual world, minding their own beeswax. That’s when Jenny came along, NPC-turned-adventurer, Defender of the Dejected, Champion of the Grotesque. Yeah, she’d show those ruthless players a thing or two. And she did too. In no uncertain terms, and I’m damned proud of her for it. Problem was, I didn’t actually know what I had with Stormbane. I wrote it to scratch an itch. I wrote it for myself. And yeah, everyone from Stephen King to Steven Pressfield will tell you that’s the best way to go. Well, almost. King will add in a rather vital detail. The “ideal reader”. His ideal reader is his wife, Tabitha. At least that’s what he said in On Writing. Yup, so Stormbane was never written for an “ideal reader” and therefore no-one seems to have found it “ideal”. Tip: Reading tastes can be extremely individual. If you don't have an ideal reader in mind, find one before you progress too far into the book. Unless you're fine with only one person (you) ever wanting to read your book. It turns out that I knew how to pitch game stories but I didn’t have the faintest idea how to sell a story about games. I got a cover done up, rather on the cheap I must admit. I slapped Stormbane up on Amazon and then waited for the dollars to roll in. And I waited, and I waited. Yes, a sale here and there, amounting to the price of a family feed of fish and chips, money I’d already spent on a feed of fish and chips for my family in celebration of me writing and publishing my first book in fourteen years. Tip: Success in one field of writing doesn’t guarantee success in another field of writing. The effort you put into learning to market in your chosen field will pay off. Time passed, I busied myself with game contracts and a book about game writing, until an opportunity arose to dust Stormbane off, slap a new cover on her, and re-publish her in alliance with a game called Goblins of Elderstone. Awesome book, awesome game, what could go wrong? Well, for a start, I re-published the revised Stormbane without telling anyone I was re-publishing. That was my first mistake, because low and behold, someone who bought the first version of Stormbane bought the second version, were naturally disappointed to find they’d accidentally bought a book twice, and said so in the Amazon review. The only Amazon review that the revised Stormbane has received. Tip: Be completely open with your audience, even when you don’t think you need to be. Oh, but it gets worse. Because I didn’t know who my ideal reader was for Stormbane, I wrongly identified my target audience for Stormbane. I saw this wonderful genre called LitRPG, a young frontier of fiction that’s a perfect union of my twin passions, science-fiction and RPGs. 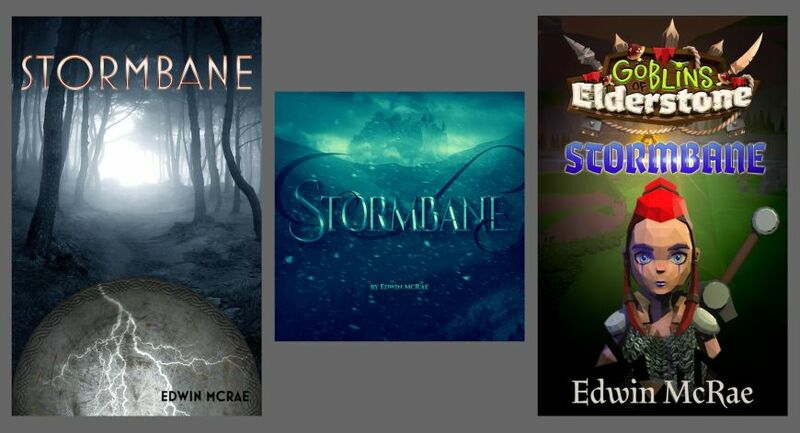 So I said to myself, Stormbane is set inside an RPG so surely LitRPG fans will love it. And I even made this dumbass decision after reading several LitRPG books. Stormbane doesn’t contain mechanics or stats. LitRPG books do, it’s one of its defining features, one of the core reasons why certain readers (myself included) love LitRPG. A good LitRPG should almost feel like you’re vicariously experiencing an epic RPG. Stormbane is a critique of RPG conventions and gamer culture. That’s not a comfy fit. On hindsight, I should’ve labelled Stormbane as “Gamelit” from the outset. But I didn’t, so I ended up targeting the wrong fans and paid for it with a lukewarm reception and dead-cold sales. Tip: Know the genre, write for that genre and sell to fans of that genre. Alrighty, so I learned my lessons from Stormbane so here’s hoping I’ve learned them well enough when it comes to my latest book, Warlock: Reign of Blood. My ideal reader is an RPG gamer who loves action, character progression, quests and all those other things that I too love about RPGs. I’ve spent the last year and a half reading LitRPGs, learning from the LitRPG community. I’ve written Warlock very carefully, always keeping in mind that it’s a book, dammit, not a game. There’s an RPG system at play in there with character stats, skill sets, XP and chain quests. There are detailed battle scenes, character-building sessions and RPG gamer strategies. And it’s all encased in a high-action, dark fantasy narrative. So thank you, Stormbane. Thank you, Jenny of Elderstone. You have taught me so much.